Glossary of Antique Glass Terms, words and phrases. Used in describing antique glass or glass production methods. A collection of frequently used antique glass terms and their meanings that apply to the products of everyday glass production and art glass manufacturers. This is, as far as possible, a laymans non-technical glossary. Designed to help with the collector and non-professionals understanding of glass terms. For the sake of clarity; our Antique Glass Terms are intended to be a simple introduction and not a completely authoritative or all-inclusive guide. The float glass process is used to produce virtually all common window glass but it isn’t used in art glass production. 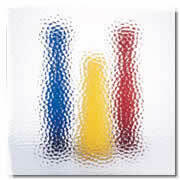 Other methods produce different types and qualities of glass particularly the hand-cast and the vertical-draw methods. The process of cooling heated glass at a slow, controlled rate in order to relieve internal stresses and brittleness. Without proper annealing, heated glass will crack or shatter upon cooling. The time required for effective annealing is primarily dependent on glass thickness. Drawn Antique: Also called semi-antique, machine antique or new antique. A simulated full antique produced by the Vertical Draw method. (See Sheet Forming Methods) The textural striations are mechanically applied. Quality is excellent and cost is less than full antique. GNA (German New Antique) is a common example. Scribed Antique: A simulated full antique produced by the Double Roll method (See Sheet Forming Methods) The linear striations are scribed into the hot glass surface. Quality is excellent and cost is considerably less than full antique. Introduced by Spectrum Glass in 1996 under the trade name Artique. A machine made “reamy” glass, created by combining glasses of mis-matched compositions. The different glasses oppose each other when they are stirred together, creating artistic 3-D swirls. Produced exclusively by Spectrum Glass. Cold glass (usually clear, thick plate) with edges that have been ground and polished to an angle other than 90 degrees. Transmitted light is refracted and a prism-like effect results. Bevels are available in a variety of sizes, shapes and geometric configurations (called “clusters”) for incorporation into leaded glass work. 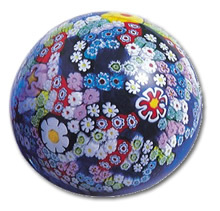 The paperweight on the right was hand-crafted in Murano with millefiori and deep blue glass canes covered with a clear glass dome. It’s about 2 1/2" in diameter. A glass art medium in which glass is melted in, or melted and poured into, a pre-shaped mold to create a finished project. Describes transparent glass that is monochromatic — ie; single color sheet glass, with smooth or textured surfaces. A surface texture resulting from the chilling of hot glass on a cool table. The appearance is likened to the paw prints of a cat. Paper-thin elements of glass that can be incorporated into fused or blown glass designs. Also called “shards. Thin, narrow strips of adhesive-backed copper tape used to wrap the edges of glass pieces that have been cut to fit a pattern. Once wrapped, solder is applied, bonding the glass pieces together. Assembling a stained glass project in this manner is called the copper foil technique. Louis Tiffany is credited with its development. 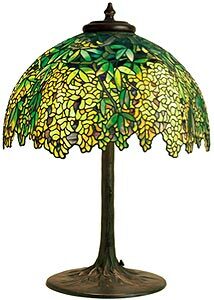 This technique was first used by the Tiffany studios in the 1880’s and is most famously seen in the stunning windows and lampshades made by them for the next forty years. It is a tecnique well suited to making small three dimensional objects such as boxes, terrariums and lampshades as well as being good for making internal windows, suncatchers and mirrors. A hot cylinder of glass is dipped in liquid, causing radical, random fissures in the glass. The cylinder is then reheated and further blown to heal the surface fissures. The resulting surface resembles the texture of alligator skin. Crackle glass was originally made by the Venetians, but most of the examples found today date from the 1800s. The glass was heated, cooled, and re-fired so that many small lines appeared inside the glass. It was made in many factories in the United States and Europe. Made using the Blown Cylinder or Full Antique method. Thick (usually 1 inch) slabs of cathedral glass. at varying angles of incidence. 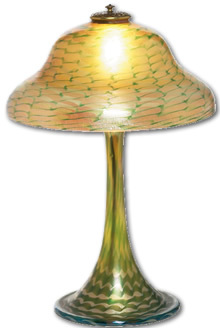 Favrile iridescent glass is a type of art glass patented in 1894 by Louis Comfort Tiffany. 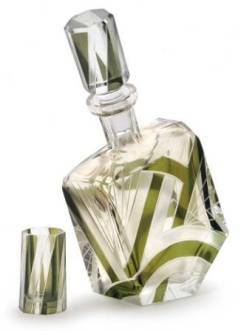 The iridescent effect of the glass was obtained by mixing different colors of glass together while hot. The trade name Favrile was derived from an Old English word, fabrile, meaning handcrafted. (Or ‘French’ as per the reference in the Louis Tiffany biography). A texture created on the surface of cold glass by applying hot animal glue and allowing it to dry under controlled temperature and humidity conditions. As the glue dries and contracts, it chips the glass surface in a natural and attractive pattern, like frost on a window pane. Sheet glass pieces joined with metal strips, usually made of lead, called came. Solder is applied to the joints of the came to bond the work together. Glass containing lead as a raw material as in leaded crystal. 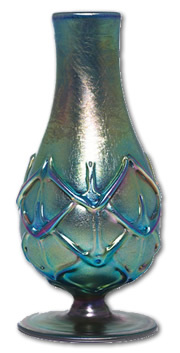 A fetuccini-like glass shape used as a decorative element in the hot glass arts. A small, irregularly shaped glob of glass, flat on the bottom, rounded across the top. Nuggets are made by literally dropping a small amount of molten glass onto a flat surface. 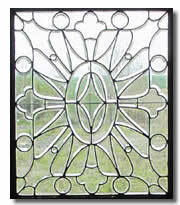 Frequently called globs, they are often incorporated into leaded glass artwork. Said of any glass into which a material has been introduced at the raw materials stage, usually fluorine or phosphorus, which causes a degree of crystallization to occur, and creates opacity in the glass. Reflected light is colorless, therefore white. The degree of opacity and whiteness is variable depending upon composition and temperatures used in the manufacturing process. White glass is called commonly referred to as opal. Solid Color Opalescent Glass: Glass which is both colored and crystallized, creating a single color sheet, more opaque than Cathedral Glass. Sometimes called opaque glass. 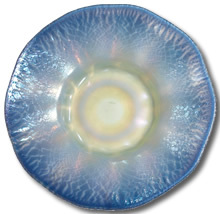 Mixed Opalescent Glass: White glass (opal) mixed with one or more other colors to create a variegated, multi-colored sheet. Light transmission varies with composition. Also called variegated opalescent or sometimes called streaky. Glass on which special paints containing frit, have been applied in an illustration or decorative pattern and then heated in a kiln to a temperature high enough to fuse the pigments permanently to the glass surface. The modern version of the original medieval stained glass. Pâte de verre is a labor-intensive form of glass casting that dates to the second millennium B.C. The Mesopotamians were the first to leave records of the process which they used for inlays in jewelry and sculpture. The Egyptians improved on their techniques, using pâte de verre in intricate mosaics and vessels between 1500 and 1000 B.C. The Egyptian word for pâte de verre translates to "stone that flowers," no doubt because of the gem-like quality of its color and light reflection. In the 4th and 5th centuries, Persians used pâte de verre to produce exquisite vessels. Glass studios prospered across the Middle East through the 1st century A.C. and the process became increasingly refined. Descriptive of full antique glass with a wavy irregular surface. Used to describe cylindrical, pencil-thick sticks of glass used primarily in flameworking and glass bead making. They are available in a wide color range and with many expansion coefficients. A mouth-blown piece of glass that has been spun into a circular shape, often irregular. Sometimes incorporated into leaded glass artworks. Machine-made facsimiles are common, called pressed rondels. An alloy, usually tin and lead, used to join metallic parts, or the act of applying it. Used to bond metals in both the leaded and copper foil techniques of stained glass work. Commonly used to describe any colored flat glass or any object made of glass joined by metal strips. The term originally applied to colored or clear flat glass cut to fit an artist’s design, on which details were painted in pigment with a brush. 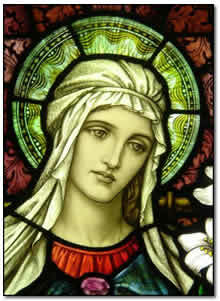 The glass pieces were then heated in a kiln or oven to bond the pigment to the glass surface. 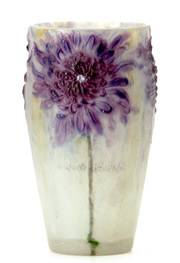 The firing makes the painted detail as durable and permanent as the glass itself. Most religious-themed windows from medieval times until this century were executed in this manner, and so the term came to be used first for any architectural application, and then for any design in colored flat glass. Stained glass is now universally accepted as a convenient general term to define the art, craft and industry for creating colored glass. Uniform clear glass pellets used as a raw material in glass blowing, glass casting, and fusing. Part of the System 96; family of Tested Compatible products. A broad family of Tested Compatible glass materials for the hot glass arts. Suitable for blowing, fusing, casting, flame work and any combination of these media, System 96 is a partnership of independent companies who test their products to an identical standard to assure their compatibility. Glasses which have been tested and marked prior to sale to verify compatibility with each other when combined in a hot glass process like blowing, fusing or casting. Rolled textures: In rolled glasses one of the forming rolls is embossed with a texture that is imprinted on the glass as the sheet is formed. This produces glass smooth on one side and textured on the other. 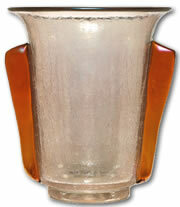 Common Pilkington examples are hammered glass, mayflower glass and bark glass. Natural textures: Any textural effect created without mechanical influence or embossed rolls. Cold glass textures: this category includes glue chipping, etching, sand blasting and any other surface treatment performed on the cold glass sheet at room temperature. A natural surface texture created by stretching the hot glass sheet while it is still in a malleable state. The result is gentle, rolling waves that resemble the surface of a lake or stream. Produced by Spectrum Glass. Mixed opalescent glass with only thin wisps of white, like lazy cloud trails. Produced by Spectrum Glass. Sheet glass types are often delineated by how the sheet is formed. People often speak of mouth-blown glass, double-rolled glass, drawn glass, float glass, etc. Molten glass is poured onto a metal table and a single metal roll is used to flatten it into a sheet. Sometimes called “hand cast” sheet glass. Molten glass is pulled up vertically through a slit in a large refractory block (high-temp brick used in glass-heating ovens) that is floating on the glass surface. An annealing lehr (chamber through which the glass travels and gradually cools) is mounted vertically over the draw chamber. Drawn glass is generally more pristine than rolled glass because its surface remains untouched during forming. Molten glass is pulled from the forehearth, the chamber where molten glass cools to a workable temperature after emerging from the furnace, then floats on to a bath of molten tin. The process produces a perfectly smooth sheet of glass of uniform thickness at high volume rates. The float process is used to produce virtually all common window glass today, hence the term float-glass is commonly used to refer to sheets of glass, but the float glass process is not used in art glass production. Opal (white): Fluorine and alumina (A12O3) to cause the fluorine to crystallize to opal. Clear: Sand with very low iron (FeO or Fe2O3) is required, plus the absence of contaminants in other ingredients. Cobalt (blue-producing) is often added to mask the greenish-brown tint that results from trace iron content. Lime Green: Chromium oxide (Cr2O3). Emerald Green: Chromium oxide with cobalt oxide (CoO) and copper oxide (CuO). Turquoise: Same basis as emerald green but with higher ratio of CoO and CuO to CR2O3. Blue: Cobalt oxide and copper oxide. Different blue shades can be made with each of these used alone. Spectrum uses both to obtain a desirable blue hue. Orange: Cadmium sulphide and selenium (Se). Red: Cadmium sulphide with selenium in higher proportion than for orange.